National parks offer perennial destinations we are all familiar with, while national trails take those experiences and extend them thousands of miles further across America. 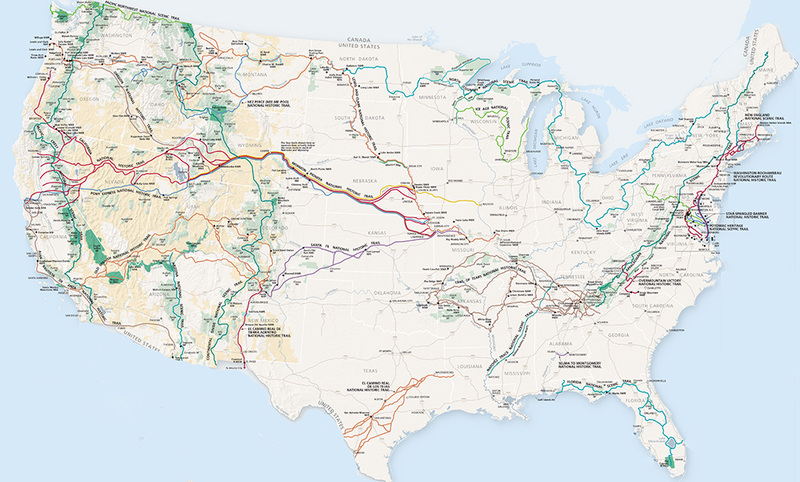 Most of America’s 30 national trails are administered by the National Park Service. Eleven of these routes are designated as scenic trails and 19 as historic trails. Visitors in a national park may not realize they stand a few feet from a trail that is 3,000 miles long. In Yellowstone, for example, the Continental Divide National Scenic Trail winds through the center of the park and hundreds of hikers follow this route each year from Mexico to Canada. Over 50,000 miles of national trails are spread across the nation and these routes pass through 49 states, inviting all of us to step outside our normal routines and experience unique pathways that connect our diverse lands. It’s possible to walk for just an hour on a trail like the Appalachian and have an intimate, unforgettable experience. The Pacific Crest Trail travels through six different national parks during its 2,650-mile journey from Mexico to the Canadian border. Whether it’s a thru-hiker’s multi-month sojourn or a day-hiker’s afternoon of peace, insight and delight, trails connect us all to the land. Urban areas aren’t left out of this treasured selection of pathways. More than 20 major cities across America feature voyages into the history of the nation. San Francisco hosts three national trails within its city limits. One of these routes, the Juan Bautista de Anza National Historic Trail, retraces the 1776 journey by Spanish explorers to establish the Presidio of San Francisco. “National historic trails tell a different story, looking at America’s heritage by the movement of its people instead of just at one site,” says Naomi Torres, superintendent of the Anza Trail in San Francisco. Washington, DC also has several examples, such as the aquatic Potomac Heritage and Captain John Smith trails — both of which can be explored by kayak or canoe.